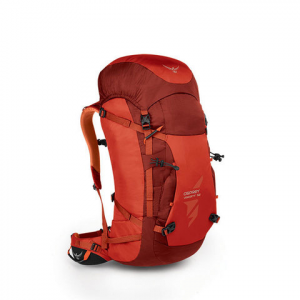 Versatile and durable, the Osprey Variant 52 backpack was made to change for any adventure from hiking to climbing to everyday, this one is perfect for all. Four interchangeable hipbelts with different sizes means you get the perfect fit, strap it on for support during a hike or stow away to keep movement free during a climb. With thoughtful and tested features including glove-friendly buckles, a three point compression system for securing big loads and gear loops for downhill and crosscountry skis and a ice axe holster. Add on a water resistant front pocket and a extendible spindrift collar to keep out any amount of snow and water, you got the pack to take with you through any adventure.